It was one year ago today that the Philae Lander bounced, spun, and tumbled across the surface of Comet 67P/Churyumov-Gerasimenko. To commemorate the historic event, the European Space Agency has released an animated video chronicling the lander’s chaotic landing. To piece together the details of the Philae landing, the ESA has spent the better part of a year analyzing the data collected from an assortment of instruments and sensors. This project is making it possible for mission scientists to understand what happened on that day, and to use that knowledge to better understand the composition and structure of Comet 67P/Churyumov-Gerasimenko. 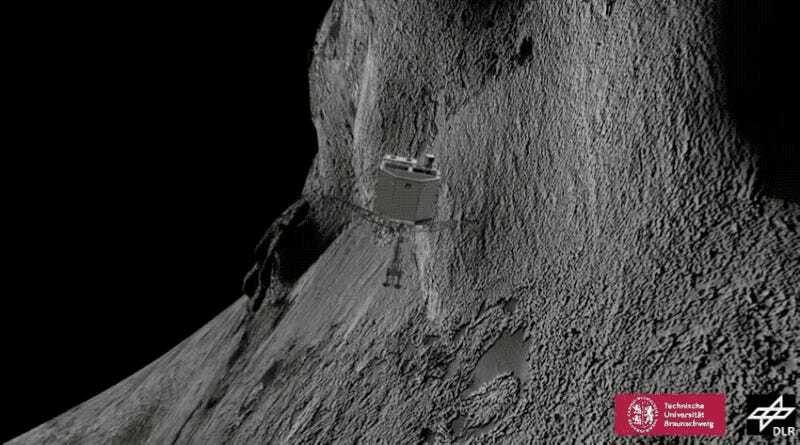 After separating from the Rosetta mothership, Philae ventured slowly down to the surface. After its seven-hour descent, it made touchdown on a spot dubbed Agilkia. Its legs sunk to a depth of about 0.82 feet (a quarter meter), indicating that it had made contact on a soft, granular surface. When it finally hit solid ground, the lander bounced back up into space for nearly two hours. Philae finally settled down at a spot called Abydos, but not after another two bounces and a collision, possibly with a rim crater. Analysis also showed that Philae entered into quite a tumble during its journey across the comet. Remarkably, Philae’s momentum was enough to right the lander up onto its legs again and eventually into its final resting position.